A quiet week by my standards, but with a theme about promoting enterprise. First of all our social enterprise is moving forward – at last the bank account has been opened - with The Co-operative Bank. It’s taken a while as they have done due diligence as the social enterprise is sourcing goods overseas, but this is now done. The office will be based on the first floor of the Royal British Legion Industries premises in Leatherhead. The next step is to recruit the staff to set up the office and systems, and then get going. Met with a member organisation this morning who has suggested another high tech product that could be marketed. Our next (free) workshop for young people about HOW To get into self-employment/social enterprise runs on 11 April and was of considerable interest to the Surrey Connects; Knowledge Economy working group – chaired by the Principal of NESCOT (FE college). The development of our new website is going well – the designers are a bright young firm in Guildford called Creativitea about which more later. Meanwhile, we launch the next issue of Surrey Youth News with our new brand with which we go live next week. The point is that the crossed keys in our current logo are really only understood by our Chairman and few others – relates back to “old Surrey” before London Boroughs. So we have strived for a more contemporary look and emphasising our role in “Improving the lives of young people by supporting our members” by championing, Inspiring and empowering. Easter beckons, so have a great long week-end, whatever the weather! The week has been dominated by two activities. First, Surrey CC Youth Support Services have had a series of open meetings to promote their revision of the Local Prevention Framework (LPF) funding (£2.5 mill over two years) which has moved from being a contract to a two year grant. The purpose of the grants, which will be awarded by the County Council's Local Committees, is to maintain young people in education, training or employment. The process of applying is still on a bidding basis, via the Council's "procurement portal" (ie on-line, only) and some voluntray organisations will find this tricky to use. Others will find it tricky to do work with young people outside of school hours and at week-ends/holidays, but this is what is wanted (for otherwise the young people should be in-school). We are assisting SCC in promoting this as an opportunity for the vol. sector and can advise on bidding. The second activity has been the office working on launching our re- branding (from 1 April) with a brilliant issue of Surrey Youth News coming out...a collectors item - thanks to Kate Peters. Our Members benefits are being constantly enhanced by new deals and we have now done a deal with a national insurance company to provide discounted and competitive rates; we are also concluding a partnership arrangement with Business in the Community (thanks to Shelagh West). Our next workshop for young people about How To set up in self-employment/social enterprise is on 11 April in Redhill , and the message is beginning to get round in the same way as our"Youth Work- the Basics " course is well known (18 people on the last course). I am advising the Consortium on longer term grant bids and doing really interesting work- met at County Hall about Troubled Families which SCC calls Supporting Families, and last night was at Surrey Uni trying to recruit an intern for the summer. We have advertised for a business admin apprentice. So it's all going well..except no heating in the office...and rugby which we don't talk about (but I did say I was apprehensive)...and me curtailing my charity marathon walk last Sunday at the half way stage as I was so cold/wet. Read autobiography of Ignatius of Loyala this week (founder of Jesuits...the Order the new Pope belongs to) ...and heard a great new (to me) piece of choral music which I have now bought. Cold week- end in prospect..where is Spring? The work done on re- branding will come to fruition shortly with an imaginative launch of the re- brand from 1 April, and reflected in the next edition of Surrey Youth News due out around Easter. We commissioned the design through a social enterprise called Concept Cupboard that has just won a Toast of Surrey (Surrey Chambers) Award. Linked to the re-branding is work we are now just starting with an exciting design studio in Guildford called Creativitea (sic). So these developments will enhance our reach to existing Members and new Prospects. In that respect, we are doing mapping work with pro bono help from Ordnance Survey to map the location of all youth organisations by district/borough, to then overlay the location of Surrey’s top 500 businesses . This will help us with marketing to new prospects and ensure that existing Members can see the location of possible business contacts. Incidentally, our new Members’ site will have password controlled section for Members only so that it is there we will place future benefits such as the mapping work and also our other Member benefits. We have for example just negotiated a very good offer with a national insurance company giving a 10% discount to Members. Meeting on Tuesday with colleagues taking forward the social enterprise, and quite a lot of work to do there – branding and website (again) – this really is the age of marketing. I have also been working on development bids for the Consortium and had a Board meeting this morning. I have received complaints (if only from my wife) about being one (work) or two (rugby) or three (theology) dimensional, and so here for the skeptics (sic) is my latest fiction recommendation to demonstrate my literary side: “The Reluctant Fundamentalist” by Mohsin Hamid. Easy read and very gripping/powerful novel. Anyway ..back to the important bit (!) ..very apprehensive about the Wales v. England game on Saturday after England’s scrappy game against Italy last week. I am concerned the lads have gone off the boil…. Good England team out tomorrow against Italy and my boss (the England Manager) has resisted the temptation to do anything experimental, which is good. Quietly confident despite Parisse returning for Italy. Ah yes work…….has been good but paying the price for taking a day off on Monday. The social enterprise is taking off – met amazing supplier of one of the electronic goods we’ll be selling – an IT expert from India now running his own cutting edge company – PhD. Worked for Intel in USA , various professorships, and 132 patents to his name. He said that 20% of the world’s energy consumption was taken up by computing. Contacted Guildford FE College about the training of the CiC recruits once in place. The office is at the Royal British Legion Industry’s depot in Leatherhead. We have also launched recruitment of an Apprentice for us in our office here in Business Admin. We are talking to various companies about revising our website and have a front runner with whom we’d be delighted to work – more later once agreement reached. Even I, notoriously technophobic, am excited at the prospect! I have circulated my briefing paper about the Ministry of Justice’s two big policy initiatives (outsourcing the probation service, now called NOMS) and creating secure education colleges for young offenders . Very busy with our own funding bids and initiatives, and also advising the Consortium. AND FINALLY , don’t forget Mothering Sunday this week-end! Another great week. Two VERY important new initiatives from the Ministry of Justice (Chris Grayling, MP Epsom&Ewell). One is to break up the National Offender management Service(NOMS) and put it out in 16 (regional ) Lots each worth £90 mill. to the third sector. Big E- debate as to whether the vol sector can in fact participate, or only the Capita, Serco, G4S contractors. Second is to put more education into youth offender prisons so they become “secure colleges”. Regular readers may have noticed some Delphic references to “developments” which I can now disclose, and explains the interest in the above. 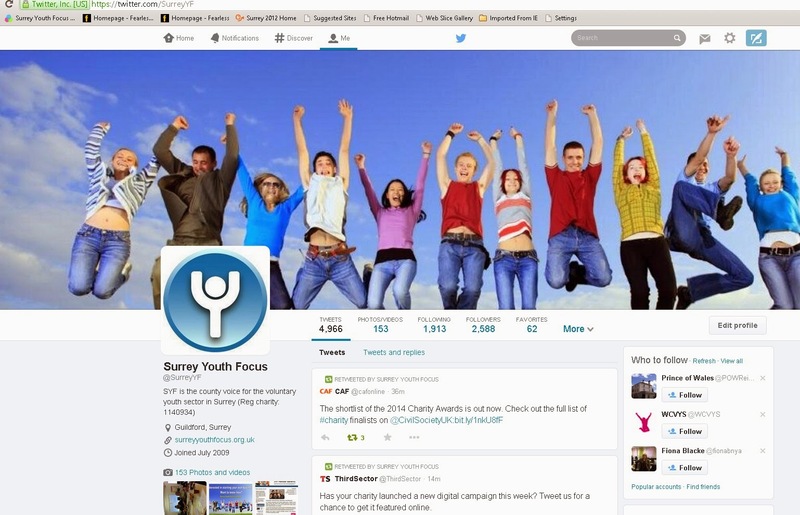 First Surrey Youth Focus is selling some support services to The Youth Consortium including: help with social media, mapping of all youth organisations AND top 450 businesses – courtesy of pro bono work with Ordnance Survey, and time from me on spotting future development opportunities. A second development is that we have won some Big Assist (Lottery) funding with which to engage a consultant to look at how best the various youth organisations might work better together (by trading between each other) and save on support costs. Results will go to our Trustees in July meeting. Will be radical. (From Latin “radix” –root). New branding finished and to be launched with next edition of Surrey youth News at the end of the month – be interested in your feedback. Closely links to our commissioning of a website company to redesign our website completely – it dates from 2008, and is still OK but needs to be updated. Seeing a very whizzy design company next week who may do it pro bono. Two very positive meetings this week with senior managers at Surrey CC , and then yesterday afternoon a slightly odd peer review discussion by external executives as to whether Surrey CC is an innovative organisation and effective partner from a vol sector perspective. Our views seemed to be met with some incredulity. Not sure I will be participating in such events in future. But the stars of the week are Eikon and their lovely staff and young people. They had an event last night sponsored by Coutts Bank so that Eikon could receive a substantial cheque as a gift from a lady who is property developer and believes in philanthropy (see her “Give it away”website. (“Philanthropy”, Greek: Philos- anthropos = “lover of humanity”. And the lady in question clearly does, as she has given away a very remarkable £1 million to charities. Her donation to Eikon was her final donation to hit her personal goal of giving away £1 million. Brilliant – like the high quality catering from Truffles of West Byfleet. Inspirational evening – congrats to Chris and all at Eikon! No rugger this w/e but Les Rosbifs did the bizz last Sat. Italy then Wales for the decider. Singing in Chichester Cathedral on Saturday – massed choirs (350 singers-a fine noise in a beautiful building). On leave on Monday to do serious training walk(20 miles +) for my Y to Y Marathon Walk in aid of Redhill YMCA on 17 March – I shall be after your money soon! !